It was a great day. not too hot and not too cold, and most important, plenty of visitors. Only problem - they all seemed to visit at once. Luckily, we were prepared. There were enough guides standing watch to insure that all the groups were properly sized, and the guides to devote attention too every one's requirements. We had a really diverse group of visitors s well! In terms of age, I would say the youngest visitor was two, and the oldest was a WWII Vet who served on Destroyer Escorts (probably 85 years young). When you have diverse groups, in large numbers it can get a little tough. Probably the hardest tour for a guide is a big group with a wide range ages. The guide can't focus, and has to do a complex juggling act. Many of Sunday's visitors arrived during a relatively short period. However, because we had plenty of guides, we were were able to structure the groups by age. A guide with a younger group would try to give a tour that focused on a hands on experience, that moved relatively quickly. A guide with the older group would move slower and be able to relate more technical and historical information. Considering the crowd, it worked out pretty well. A nice picture of the Half Moon (sailing in for a two hour tour)! During the day we had a great deal of traffic in and (immediately) back out of the parking lot. There were a number of people who were looking for the replica of Henry Hudson's Half Moon. Unfortunately they didn't read the schedule: " The Half Moon was not open for public tours during River Day stops, but we did conduct dockside activities for the public in Newburgh, Poughkeepsie, Kingston, and Catskill." 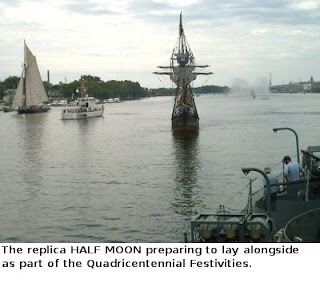 The Times Union Story seemed to imply that the Half Moon would be in Albany for a multi-day event. And, the River Day Log seemed to imply that there would be some thing going on in either Albany or Rensselaer. Unfortunately, there was no dockside activities in Albany. Despite excellent publicity, the Half Moon didn't even stop at Albany (as the schedule noted, the Half Moon just passed through). A few people seemed to get mad at the USS Slater tour guides when we noted that we had no idea where the Half Moon was! Clearly, the port of Albany is become more vibrant tourist destination. The last thing that we want is to have disappointed and mad visitors. I think that a lot of this confusion could be avoided if an official at the Albany Visitor Center emailed a weekly schedule of events at the Port of Albany. This schedule should be sent to all the venues that cater to the Port Visitors: the USS Slater; the NY State Museum; the Aquaduck; the Port of Albany (the commercial port is not a tourist destination); the Halfmoon; and the Dutch Apple. Perhaps an obscure schedule is posted somewhere - but that doesn't help. It needs to get in the hands of the people interacting with the visitors to the Port. (imho) The best way to accomplish that is to email a routine weekly schedule. Obviously the local press should be included in the email. Near the end of the day, when several guides were having a bull session, we noted that the flag from the USS William Seiverling (DE-441) that was displayed in the wardroom was moved to the museum. The plaque on the display noted that the flag was retired the day after Frank Delano Roosevelt passed away (April 12, 1945). I use to point to the Flag and note that FDR's son (Lt. Comdr. Franklin D. Roosevelt, Jr) was the Captain of another DE (the USS Ulvert M. Moore (DE-442)) which was at sea near Okinawa when he died. Both ships were launched on the same day. "A cold, blustery December day. Your life disappeared as dew on Arakawa River's bank. It is painfully sad that together with your mother you sacrificed yourself ahead of your father because of his fervent desire to lay down his life for his country. However, I hope that you, who as a young girl vanished together with your mother, will be gladly smiling. Father also will soon be able to follow after you. At that time I'll gladly hold you close to me as you sleep. If Chieko cries, please take good care of her. Well, goodbye for a short time. Daddy will perform a great feat on the battlefield and bring it as a present for you. Both you and Chieko, please wait for me until then." First Lieutenant Fujii was a kamikaze instructor. Because of his family, both Fujii and his superiors were reluctant to let him fly a kamikaze mission. Because of the reluctance, in December his wife killed herself and their daughter. Five months later First Lieutenant Fujii sank the USS Dexter (DD-741). William Gordon, at Wesleyan University developed an excellent web site on the topic of Kamikazes . He offers a balanced and comprehensive treatment. One visitor on Sunday was a WWII Vet who served on the USS Bangust (DE- 739). His General Quarters station was in the gun director for a 40mm gun. After the tour he climbed a steep vertical ladder gave his son a personal tour of a Mark 51 director. Not bad for someone pushing 85+. The tour guides were impressed. The Bagust was a real workhorse in the Pacific in 1944-45. I did a little research and found this oral history from a Bagust crewman.